Health Care Without Harm is leading the healthcare sector in moving beyond doing “less harm”—reducing negative impacts from the design and operation of health care—to a future where the sector “heals” or restores ecological, economic and social capital within communities. As anchor institutions, hospitals are embracing a commitment to apply their social and economic influence and intellectual resources to better the long-term public and environmental health of their communities. They are rooted in place, hold significant investments in real estate and social capital, and are among the largest employers in their communities. Due to their significant purchasing power and trusted role as authorities on health and wellness, hospitals have an important opportunity to not only increase access to healthier, more sustainably produced food for patients, staff, and the community, but to transform the food system toward greater health and sustainability through local sourcing of goods and services and strategic investments. Community benefit investments are one pathway for nonprofit hospitals to address healthy food access and strengthen the food system. 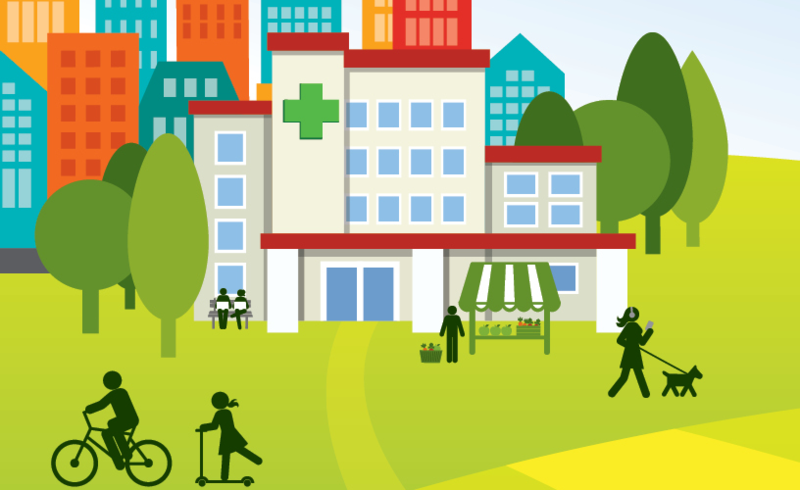 Nonprofit hospitals provide community benefit programs to maintain their tax-exempt status. Recent regulatory changes open the door for greater investment in social determinants of health by requiring nonprofit hospitals to assess community health needs and implement strategies to address priority needs. Leading health care institutions are utilizing their community benefit programs to support community programs that improve access to healthy, affordable food and at the same time, support economic and workforce development in low-income or disadvantaged communities and strengthen local and sustainable food systems. Delivering community benefit: healthy food playbook - Created with support from the Robert Wood Johnson Foundation, the playbook inspires and supports hospital community benefit professionals and community partners in developing initiatives to promote healthy food access and healthy, local and sustainable food systems. The playbook offers information and tools to address food- and diet-related community health needs throughout the community health engagement process. California Anchors in Resilient Communities project - Anchors in Resilient Communities (ARC) is a multi-sector community-based partnership, comprised of representatives from key anchor institutions in the San Francisco Bay Area of Northern California working to build resilient regional food economies. Embed healthy food strategies in your community benefit practice with the Delivering community benefit: Healthy food playbook. Food as Medicine: Improving Access to Healthy Food, examines the role of healthcare providers in helping improve the food environment for patients in California. The playbook offers information and tools to address food- and diet-related community health needs throughout the community health engagement process. Comprised of representatives from key anchor institutions in the San Francisco Bay Area of Northern California working to build resilient regional food economies.